Are you using Windows 10 operating system on your PC? 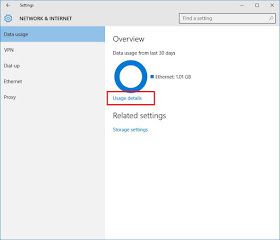 If yes, here comes the very guide on how to monitor or track the data usage on your windows 10, for better experience usage. This will go a long way in helping anyone without unlimited internet access subscription plan, for their windows 10 PC, atleast to be able to track and manage the data you got. You can attest to it that, windows 10 is very exciting having that all its features are normally controlled and used. And tracking your data usage is as well inevitable, do you believe? Now, let's get down to the very important aspect of it, which is you knowing the important tips in monitoring your data usage on windows 10 OS. Read on for that. ==>1. 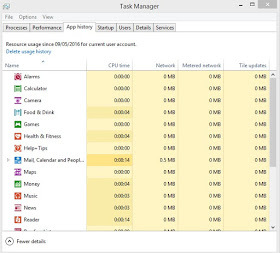 One of the very best method of tracking/monitoring your megabyte usage on windows 10, is through "Task Manager". See how it goes using the steps below on your Laptops/PC. 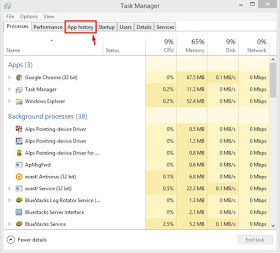 ==> look down, you will see taskbar the one at the bottom of your screen, just Right click the taskBar > Now choose Task Manager from the options shown. the history of all data usage for all the applications being installed on your PC. There, you will see the data usage for each specific application. You may like to delete the data history in order to start your monitoring afresh. However, the data usage history usually delete all kept history every 30 days. That's all for that. 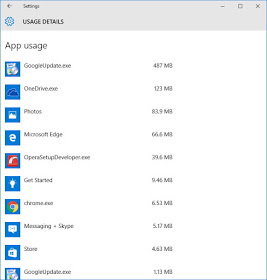 ==> click the Usage Details for specific individual app data usage. That's all for that too. Now, I believe, you can now TRACK/MONITOR/CHECK the data usage on your windows 10 OS for every specific app you installed your laptop/PC. Do you have any contribution regarding to this post, you can kindly drop it using the comment box below. And never to forget to share to friends who might be in need of this. Thanks.